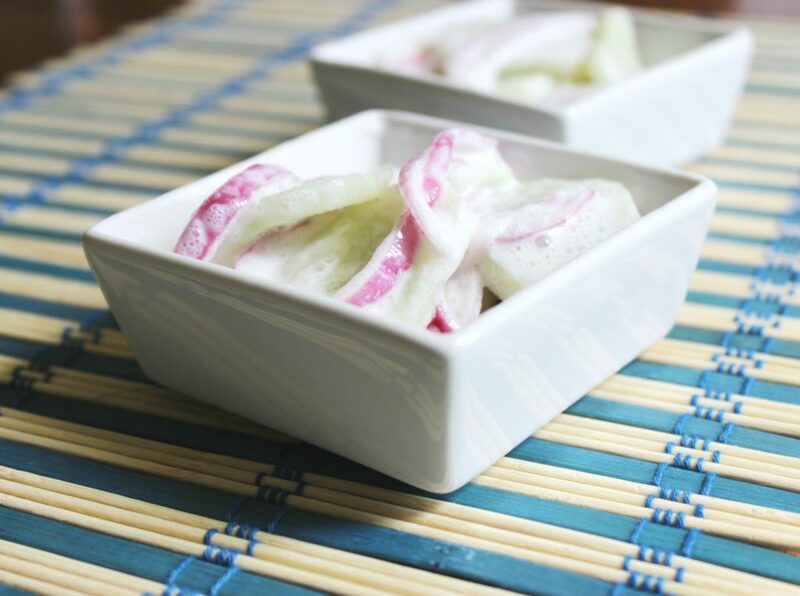 Sour Cream Cucumber And Onion Salad – Delicious! 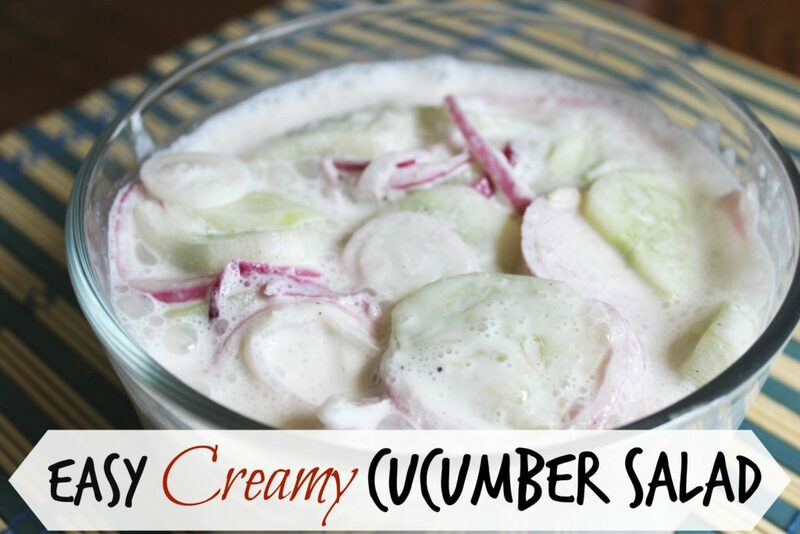 In our house we love this Easy Creamy Cucumber Salad, it is a nice twist from the classic cucumber and onion salad. I find it has a bit of a less bite to it, which is what I prefer. 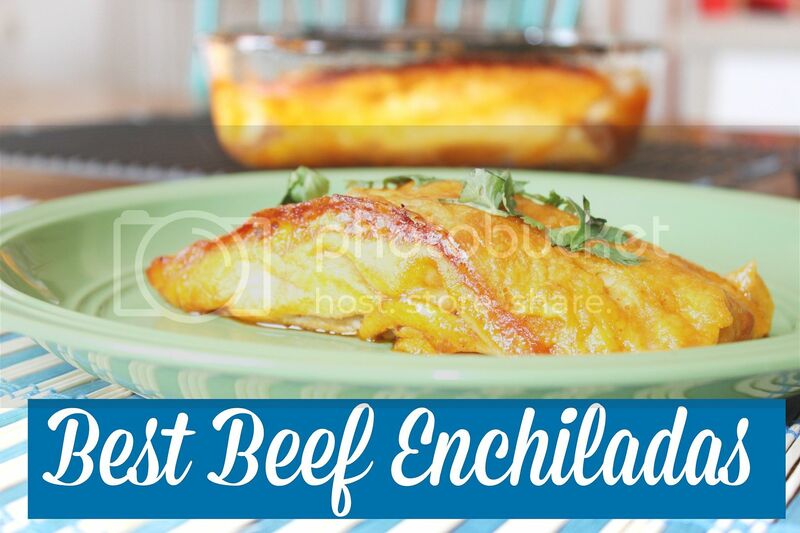 This one has sour cream, you can find some recipes that use mayonnaise, but I prefer the sour cream recipe! I like to make this every now and again! My mother in law gave us some cucumber and onions from her garden, so I thought this would be a great time to whip this recipe up! 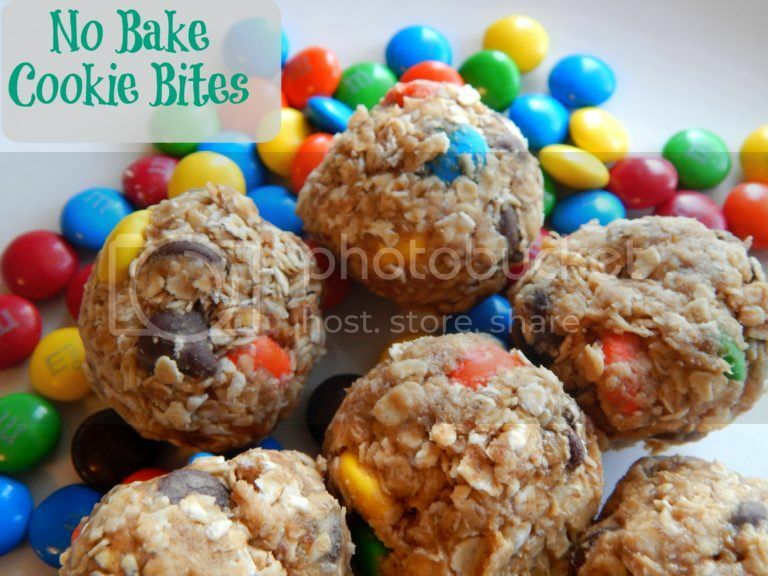 It is really easy to make and doesn’t take many ingredients! 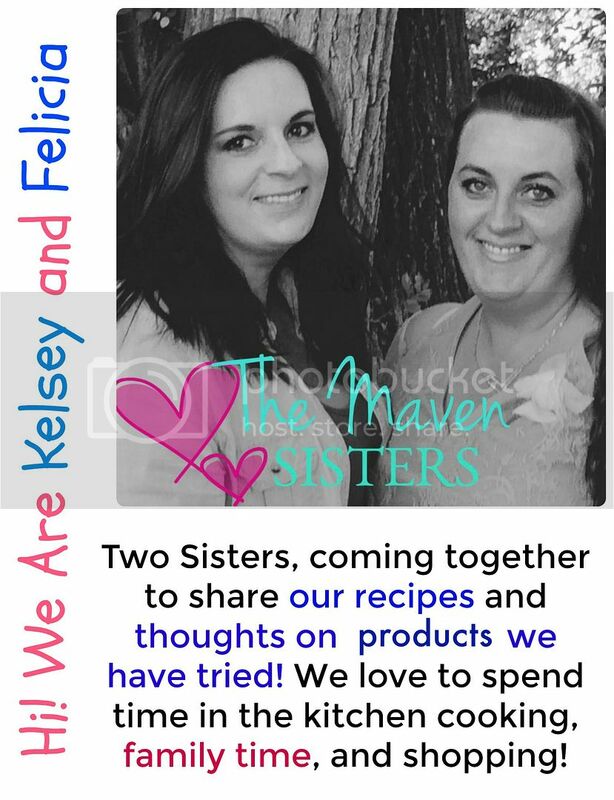 This is great recipe for family gatherings, bbq’s, and potlucks! Like I said above it is so quick and easy to make this, and feel free to add a little dill if you like it. I am not a huge fan of fresh dill so I always skip it! Once you get your cucumber and onions sliced nice in thin you will set aside. In a bowl mix your sour cream, vinegar, sugar and salt and pepper together. Then mix in your veggies, and put in the fridge for at least 4 hours before serving. They taste better if they sit over night in fridge. It helps break them down a little. I don't like my cucumber and onions to be that sweet, if you do add the 1/4 cup sugar like I said. You can always start at a little sugar taste, and then if you want more sweet add more later. As you can see it doesn’t take much to whip these up, it is just waiting for them to set in the fridge to do their magic! Letting them sit helps break down the cucumbers and onions so they soak up that delicious flavor and become a bit softer like they need to be. We always enjoy eating them the next day, but I know at times we just wait the 4 hours cause we have no will power! And there ya go, a delicious side the family will love! 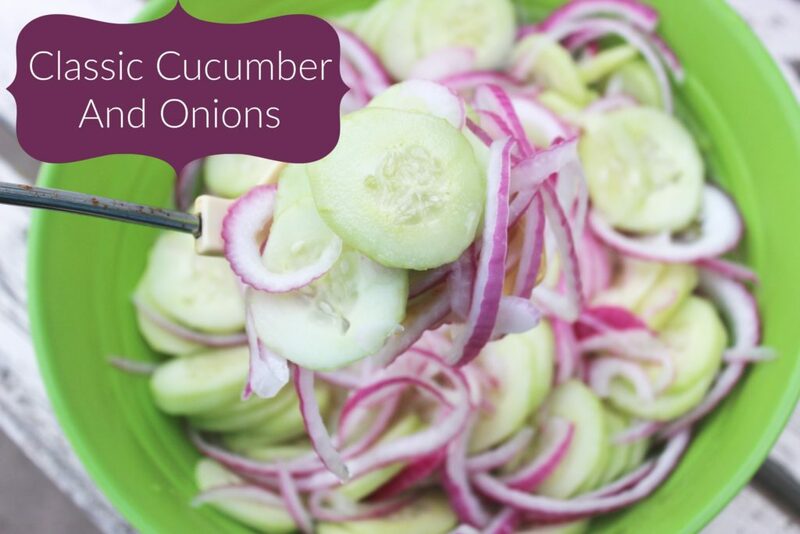 Also if you are looking for a classic cucumber and onion salad, click here for that recipe! Sometimes I just crave this Delicious and Easy Strawberry Spinach Salad. Around ten years ago, my husband and I were at a wedding that served a Strawberry and Spinach Salad. I will be honest, back in the day I wasn’t really willing to try a lot of new things when it came to food. Up until that point, I would have never considered serving strawberries and spinach together! In reality, when you mix that fresh flavor of the spinach with the plump and juicy strawberries your mouth gets an explosion of amazing flavors. 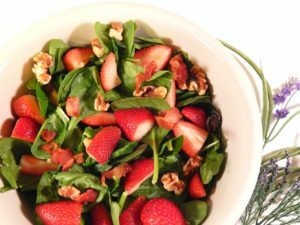 Once you try this Delicious Strawberry Spinach Salad you will be hooked! I am so glad that I tried something new, because I fell in love. This Strawberry Spinach Salad is perfect for potluck dinners and barbecue’s. My recommendation for taking this as a side dish is to bring the dressing separately. 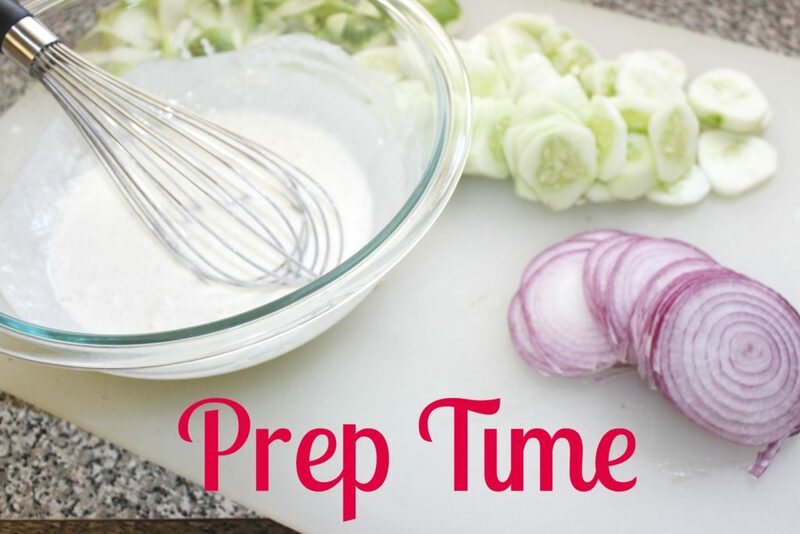 It will get soggy if you add the dressing before it is ready to be served. No one wants a soggy salad! The wonderful thing about this salad is you can really add your own flair. That original Strawberry Spinach salad I had at that wedding had craisins. Craisins aren’t my favorite, so I don’t add them. You could also add feta or goat cheese. 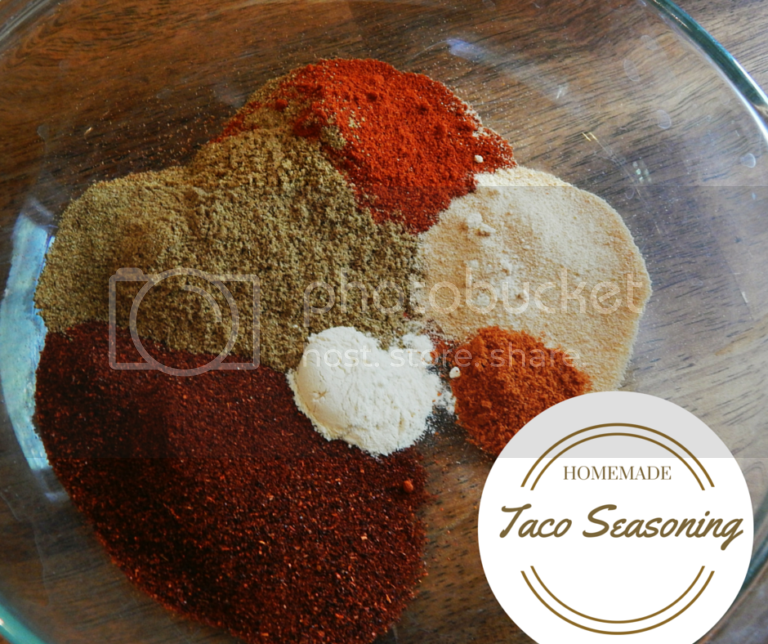 I add plain walnuts, but candied walnuts or pecans may also add a nice flavor. You can make it different each time to change it up or find that one way you like it best and turn it into a family favorite. Cook 1/2 package of bacon and crumble. Cut and quarter fresh strawberries. Place spinach in large bowl, add strawberries, add crumbled bacon, walnuts and slightly toss. Add any optional items and add as little or as much dressing as you prefer. 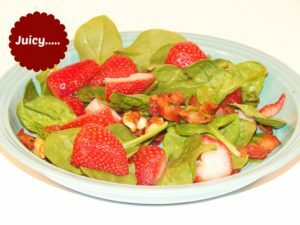 This truly is the easiest Strawberry Spinach Salad! The fresh flavors compliment each other so well. 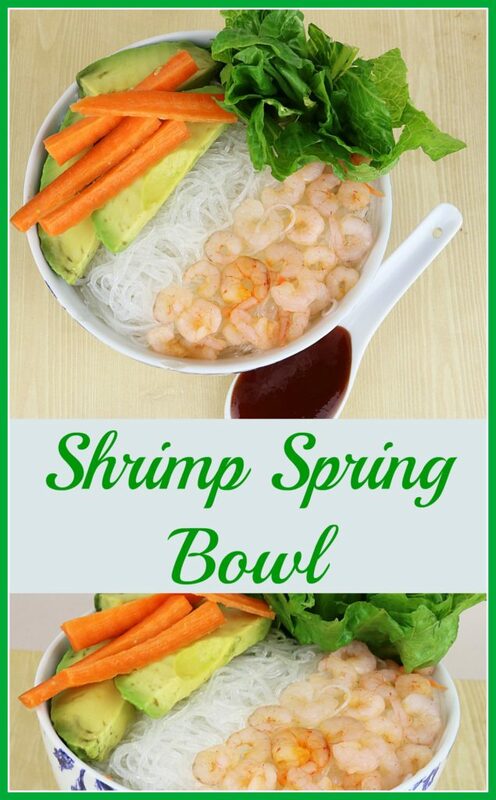 Plus, you will get lots of compliments from friends and family when they try this tasty salad. 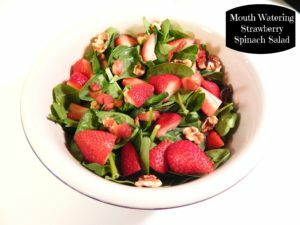 Next time you are trying to come up with something that is fresh and easy to make, I highly recommend trying this Strawberry Spinach Salad. 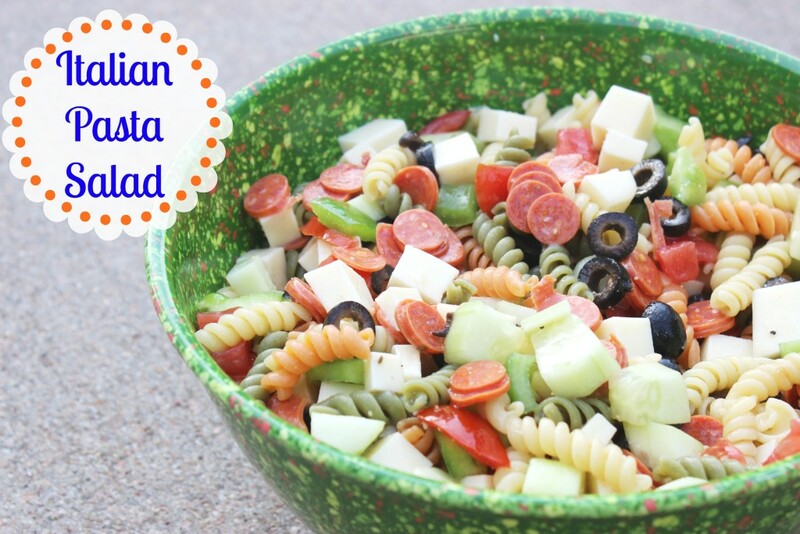 Best Italian Pasta Salad Ever – Quick and Easy! 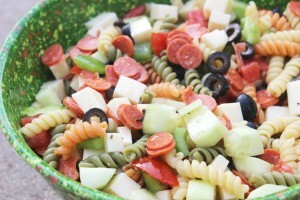 If you are looking for the best italian pasta salad ever, then you have come to the right place! 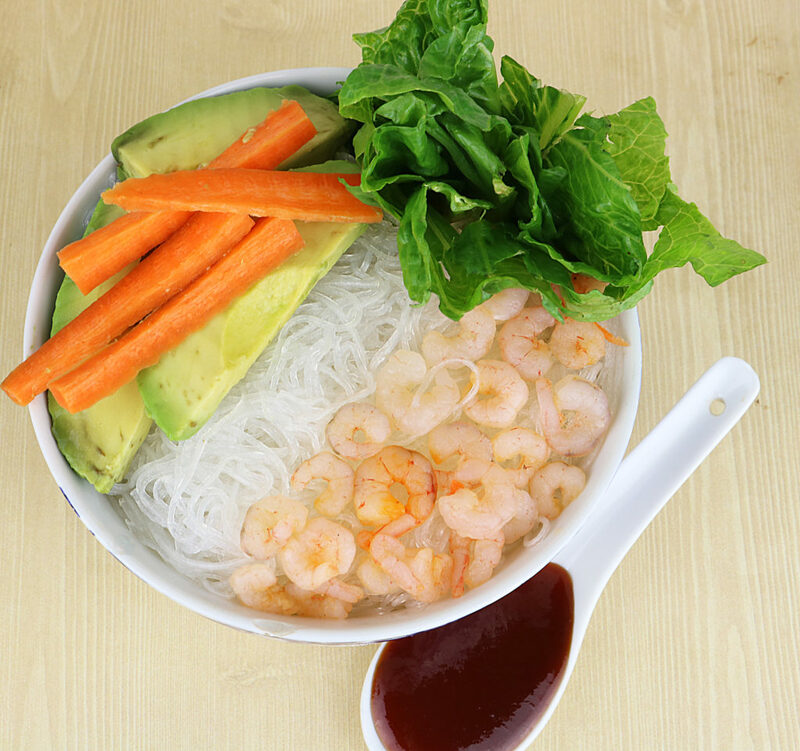 This is the recipe I have used for a very long time with a few tweaks along the way! My family truly loves this salad and is always asking me to make it! I recently got a new salad dressing and I think it made it even taste better! But, you are always welcome to use whatever italian dressing that you and your family love the most! 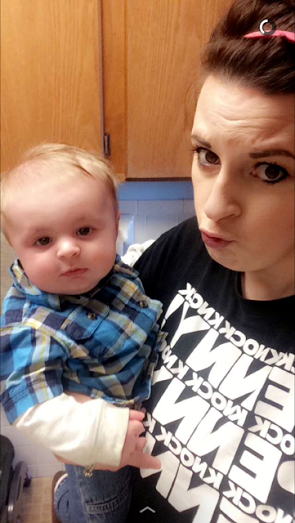 With having an almost 6 month old baby, it is sometimes hard getting dinner on the table, so I love having pasta salads in Spring and Summer months because I can make them up, and we can have them through the week! 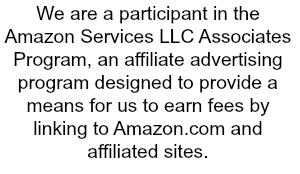 It is simple and saves me time! Plus it doesn’t heat up the house when it is 100 degrees outside! If you are interested, this is the Rachael Ray garbage bowl, my sister got this for me a few years back and I am in love with it! 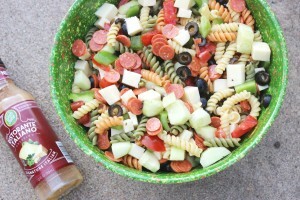 I love all the fun colors in it, and looks so pretty serving up a pasta salad in it! First off you want to cook pasta according to package. While that is cooking work on dicing up the cheese, and vegetables into bite size pieces. Place all veggies and cheese, and paste in a bowl. Pour in some of the dressing. Enough to coat everything. Once pasta is done, drain and run cold water on it till pasta is cold. Then put pasta in with the veggies and stir. At this point add enough dressing so that it is well coated. NOTE: That right before you serve it can dry up a little, just add more dressing and stir. Now, a little note, say you want to play with the veggies, feel free to add or take away vegetables so it fits your tastebuds! 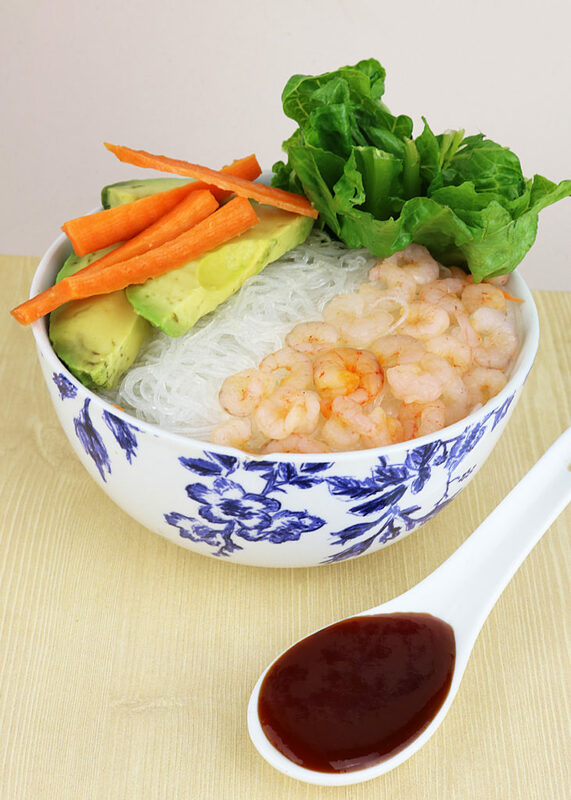 This is a very basic but yet tasty recipe, and it is very simple to make! My husband loves to eat it with Cheez It crackers, he crushes them up and sprinkles over the top. I thought it was absolutely crazy, but it is actually super tasty! Hope you all enjoy this recipe, and make sure to come back for more recipes in the future!